INTRODUCTORY OFFER FOR A LIMITED TIME ONLY. Script for Adobe After Effects CC2018, extending the use of regular effect plugins to be seamlessly used with 360° video. Enables traditional video effects within After Effects to be seamlessly used. See the product video for more information. 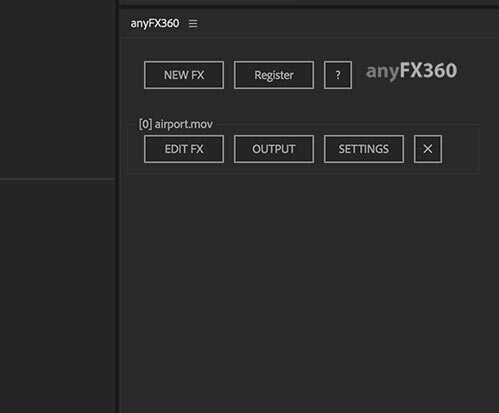 anyFX360 is compatible with most plugins on the market. We cannot guarantee the compatibility with every single effect there is. Depending on the effect plugin there may be requirements higher than the standard requirements since of the additional content/larger dimensions that need to be precomposed and rendered. Please see details and our FAQ for additional information. The serial number will be delivered by mail along with a download link and usually takes only a couple of minutes after successful payment. This product can be used on one computer for one user and requires activation prior use. When ordering this product you are bound to and accept the End User License Agreement, you can view this here.